As you can see, Green Run was a nice place.....notice the clothing of the avaition club members, they were seriously dressed up! The shine on the pine floor and the white jacketed waiter all add to the coolness of the photograph which I suspect was taken by a professional. Great photo. Enlarge to full size and you can make out some interesting details and facial expressions. The year was 1947. If anyone has any more details about the photo PLEASE add your comment and I will incorporate it in this caption! 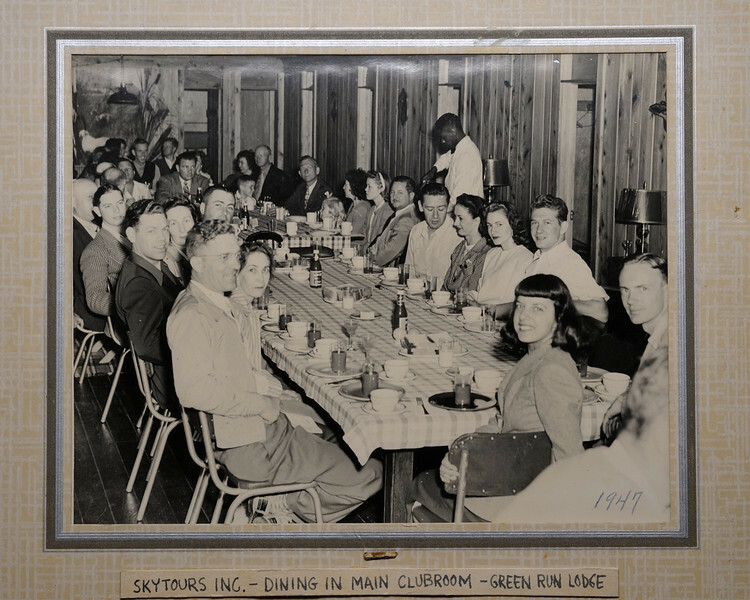 Bill Hastings oral history of Green Run mentions that many a plane broke its propeller on landing, but it only took a couple hours for one to be flown in by another club member....they kept the broken props inside the lodge for laughs!